So we are only getting older every day and this unfortunate fact is not lost on me. It seems like as the days go by I am reminded that youth is fleeting and to take advantage of it while I can. This year I turn 26 and I figured it’s time I take a cue from my sister and start taking better care of my skin. 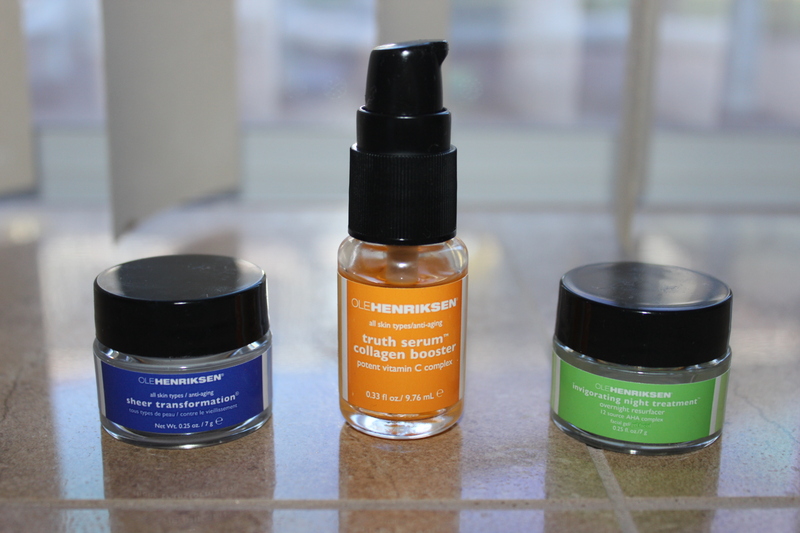 I took advantage of insane sales that Sephora was having during the holiday season and bought this trio of products in hopes to review them and perhaps make them apart of my skin routine. 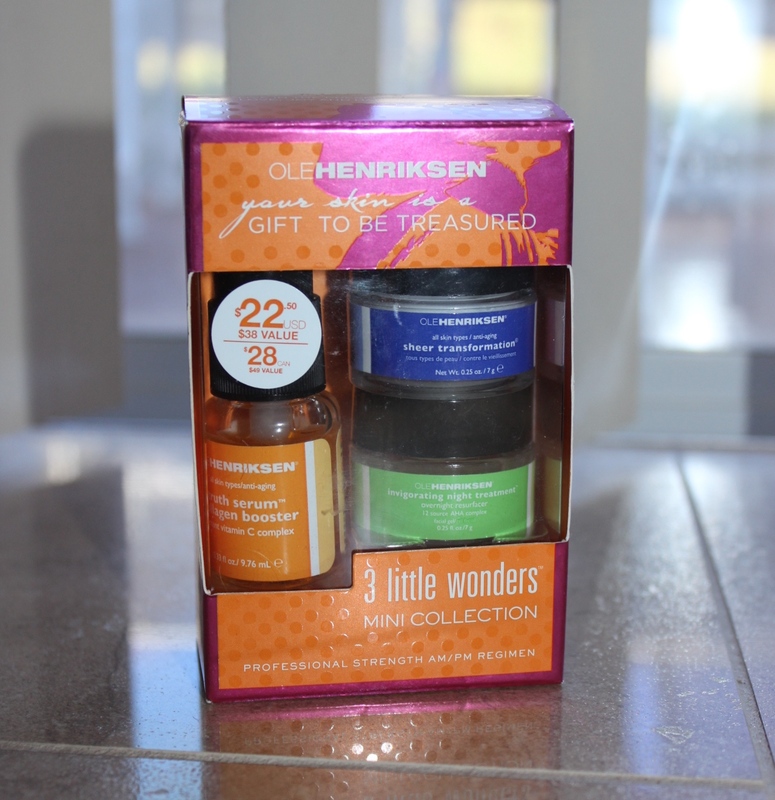 Ole Henriksen is a bit pricey but gets amazing reviews so this mini “3 Little Wonders Collection” was the perfect way to try some of the top products without fully committing to the full priced options. It includes the truth serum collagen booster, “sheer transformation” day time moisturizer and invigorating night treatment. Below are my pros and cons and a link to the item! Truth Serum Collagen Booster– Daytime Anti-Aging Serum with Vitamin C said to brighten, firm, reduce the appearance of lines and wrinkles and prevent future damage. It is incredibly light weight and glides easy over your face. It does not provide any moisture but does have a pleasant smell and my face feels a little tight right after putting it on (I’m assuming this is where the “firming” comes into play. Follow up your serum with the Sheer Transformation meant to diminish dark spots, sun damage and protect from free radicals. This lotion is super lightweight and takes away the tight feeling from the serum. It is oil free and has not made me have acne break outs with 1 month of use so far. Lastly the Night treatment is just that, solely for use at night seeing as its meant to resurface your skin to smooth texture, fine lines, wrinkles and even the look of big pores. In using this product I did notice slight peeling of my skin especially in sensitive areas like my nose and chin. This is not necessarily a bad thing seeing as it’s meant to essentially take off the dead layers on the surface. Trust me it is not comparable to getting a chemical peel or flaking like a snake, it was very slight and easily fixed with some extra moisturizer. Overall I am extremely happy with my results so far and a little goes a long way so I have some time before needing to replace with full size. Don’t forget your neck or décolletage so that you can have smooth youthful radiant skin there as well. Sometimes I even spread the remaining on the back of my hands (they always can show true age).